DDR Sieger 1979 Kör 5546/44-1979 Mittelgroßer, typvoller Rüde mit viel Gepräge. Guter Widerrist, fester Rücken, Kruppe könnte bei guter Lage noch etwas länger sein. Vor- und Hinterhand noch gut gewinkelt. Sehr gute Knochenkraft, sehr gute Brustverhältnisse. Gerade Front mit sehr guten Pfoten. Korrekt Schrittfolge. Gänge könnte noch etwas schwungvoller sein. Sicheres Wesen, Härte, Mut und Kampftrieb ausgeprägt. Average height, typey male with good structure. Good withers, firm back, croup is well positioned but could be slightly longer. Good front and rear angulation. Very good bone strength, very good chest proportions. Straight front with very good paws. Walks correct. Gaits could be slightly more energetic. Sound temperament, hardness, courage and fighting instinct pronounced. 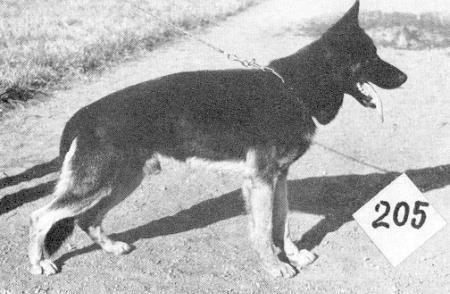 This balanced 1979 DDR sieger was bred extensively in the former DDR and then sold to buyers in the US, where he ended up with Fidelco, serving as one of the most successful sires for guide dogs (there and for Guiding Eyes for the Blind) in history. Many successful guide dogs trace their lineage back to Bodo.